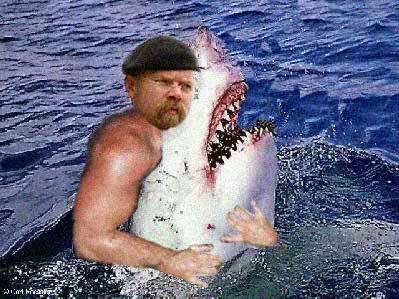 I am of the opinion that Shark Week on The Discovery Channel should be made into a national week of celebration. Festivals, shark-shaped snacks on sticks, a concert by Toby Keith, fireworks, and all the inspired jubilation – because Shark Week is just that great. Sadly, there’s not much for a gamer looking to “sink his teeth” (haha, Shark analogies haters!) for some virtual shark action, at least to my collective knowledge. The only games I do so happen to remember all have the Steven Spielberg’s Jaws license tied to them. The first game, came years after the first Jaws, and was roughly tied to Jaws: The Revenge – the fourth and final Jaws movie. Yet, this Nintendo Entertainment System game was simply titled – Jaws. Jaws was published back in 1987 by LJN, a wonderful video game maker who gave us such fabulous movie tie-ins such as Back To The Future, The Karate Kid, Bill & Ted’s Excellent Videogame Adventure, and Friday The 13th. Jaws for the N.E.S., is a rather short and kinda bland experience of a game. How so? Well, you can beat it in almost 6 minuets; give a couple of hours or so depending on how much the few first minuets bored you to death, walked away, and then realized that you left your N.E.S. on and picked up from there. I don’t want to bag on Jaws too hardly though. I mean for a mildly interesting time killer the game is perfect. There’s nothing Earth-shattering bad about that either, but I do kinda wish you could play as the shark. Isn’t that the only reason why someone would pick up a game featuring a great sea-predator such as a shark, but to experience it’s mighty ocean-mastering power? Thank goodness someone listened to our collective prayers years later, with the 2006 release of Jaws Unleashed for the PlayStation 2 and Xbox. Unlike Jaws’ 2D side-scrolling nature, Jaws Unleashed is drastically different, and can be easily summarized as Grand Theft Auto with sharks. The premise is that you take control of the original great white from the first Jaws film, and prey on the unsuspecting beach goers of Amity Island. It’s all open-world mission based; from taking down marine obstacles that poses a threat to your survival, or facing off against boats, divers, and other water-dwelling life. Sounds like fun – and if not – at least a bit humorously (or horrifically) enjoyable if this game play video is any indication. I’m pretty sure Jaws Unleashed, though with its bad camera problems, glitchy game bugs, and freeze ups, is well-regarded as a cult hit. So as Bob Barker would say, if the price is right, Jaws Unleashed is worth a go at. If anyone knows of any other shark related games, hit the comments, and share your experience.